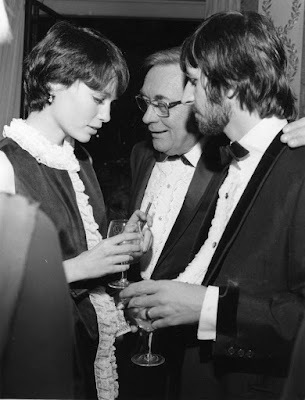 That's Mia Farrow with Ringo at a party Richard Burton threw at the Dorchester Hotel in London. They'd both recently returned from Maharishi's retreat in India. If you do a "Google" search for "Ringo Starr and Mia Farrow", you'll see photos of them dancing at the same party. This event was covered in the April 5, 1968 issue of TIME magazine and a photo of Ringo and Mia dancing was featured. I believe the Burton party took place in late March 1968. Here's the info about the party where this photo was taken. The party took place on Saturday, March 23, 1968.Ringo and Maureen were invited to a post-screening party hosted by Elizabeth Taylor and Richard Burton at London’s Dorchester Hotel in honor of the re-release of the 1956 classic, "Around The World in 80 Days". Ringo and Maureen attended, along with Rudolf Nureyev and actress Mia Farrow (whom, of course, they’d met in India the previous month). Four months earlier, the Starkeys had met Elizabeth Taylor and Richard Burton in Rome during the filming of "Candy" and became friends. Elizabeth Taylor and Mia Farrow were currently filming Secret Ceremony in London. Meanwhile John, Cynthia, George & Pattie were still in Rishikesh, India meditating, and Paul & Jane Asher were en route back to London via a brief visit to Teheran, Iran.